'Respect for the Game': NBA wants players on best behavior. Responding to fan complaints about players complaining to referees and the NBA's in-house reviews, the league wants to reduce players' negative reactions — verbal and non-verbal — to calls and no-calls this season. There will be less tolerance for players objecting to referees this season, which could result in more technical fouls. NBA executive vice president of basketball operations Stu Jackson said the league is renewing its emphasis on the NBA's "Respect for the Game" edict. "Our fan research shows that people think NBA players complain too much and they do so much more than players in other leagues," Jackson said. "That aside, in viewing our games, what we have observed is an excessive amount of complaining to referees' calls and non-calls. ... Player complaining is not really needed in our game and has no place in the game." Four seasons ago, the league began cracking down on players' reactions that were directly in front of the referee, such as "punching the air" or running up to an official and complaining. Those actions resulted in technical fouls. Jackson said players adapted but also figured out how to circumvent the rules by complaining away from the referee. The NBA will expand its "Respect for the Game" guidelines this year to include actions that are not directly in front of a referee. 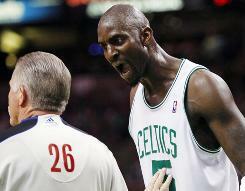 If a player turns away, but still expresses verbal or non-verbal dissatisfaction, a technical foul will be called. Jackson said a player's complaint has never overturned a foul that was called or resulted in a foul called that was not initially called. Also, excessive inquiring about calls, even in a civil conversation, will not be permitted, Jackson said. "We're updating those guidelines so we can more effectively address an expanded universe of unsportsmanlike acts by the players," Jackson said. "We have experienced some slippage in terms calling 'Respect for the Game' or penalizing 'Respect for the Game' actions and also players themselves have adjusted to the existing guidelines and have exhibited alternative ways to exhibit unsportsmanlike actions," Jackson said. Coaches were notified last week at their meeting in Chicago, and referees were updated this week at their training camp headed by Ron Johnson, Bernie Fryer and Joe Borgia. Players will be apprised of the initiative via memos and training sessions with league staff. "There will be ample coverage and opportunity to understand what the updated guidelines include," Jackson said. However, it is not a zero-tolerance policy, and players will still be allowed some "heat of the moment" type reactions, Jackson said. It could be a trying period for referees and players, especially early in the season, as the refs try to snuff out complaints and players figure out what is and isn't allowed. "While there may be reaction from the players with the updated guidelines, players are very smart and they'll adapt. … The referees are being trained thoroughly in terms of calling 'Respect for the Game' guidelines," Jackson said.